High 5 collaborates with the SIT through their Youth Peace Building and Leadership Programs. Since our beginnings, High 5 has collaborated with the School for International Training (SIT) through their Youth Peace Building and Leadership Programs. Participants come from countries around the world that are in conflict and at war, including; Protestants and Catholics from Northern Ireland, Jews and Arabs from Israel and Palestine, Bosnians and Serbians, Turkish and Greek Cypriots, and Sunnis and Shiites from Iraq. These student exchanges provide these visiting young people with a deep and meaningful introduction to American life, culture, and institutions. Through hands-on, interactive experience, students learn to communicate across cultures and develop critical thinking and leadership skills that will last a lifetime. A key component of their experience during the program is their experience at High 5, to “put into action” all the skills they have been learning in the program. Students are placed in mixed groups comprised of half of their own culture and half from the other. 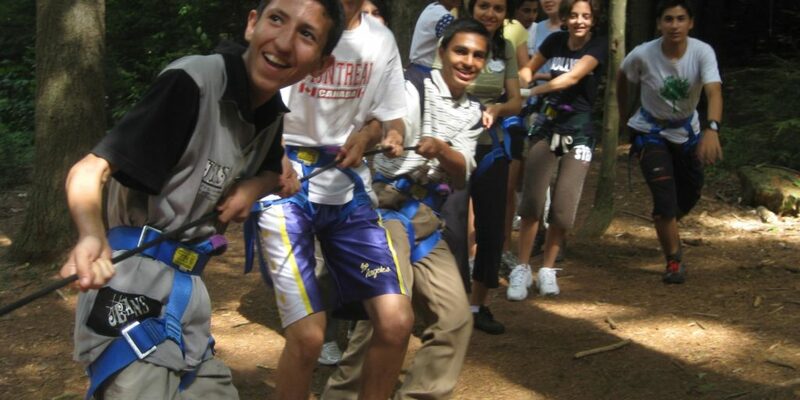 Throughout the program, they engage in a variety of experiential education and challenge course activities designed to accentuate positive communication and cooperation.